TradeZero is a brokerage firm that people who are looking to save money flock to. Not only do you have the ability to play zero commission trade, but you also have the ability to use a free platform, something that of course is rather unique. Beyond that, simply looking at the commissions saved over the course of a year can make a major difference down the road. Keep in mind that there is TradeZero, and TradeZero America, but they are under the same corporate umbrella. If you are in the United States, then you need to use TradeZero America, due to differing local restrictions and regulations. If you are looking for cheap and reliable education and trade execution, continue reading our TradeZero Review. TradeZero really shines when it comes to its trading platforms. In fact, this is probably one of the best features at this brokerage, as they offer multiple platforms, one of which is even free. You can take your pick of your platform based upon your needs, with four different platforms available. They are ZeroPro, ZeroWeb, ZeroFree, and ZeroMobile. Depending on your needs, you should be able to find something to suit your trading style and frequency at TradeZero. ZeroPro offers the most professional experience. 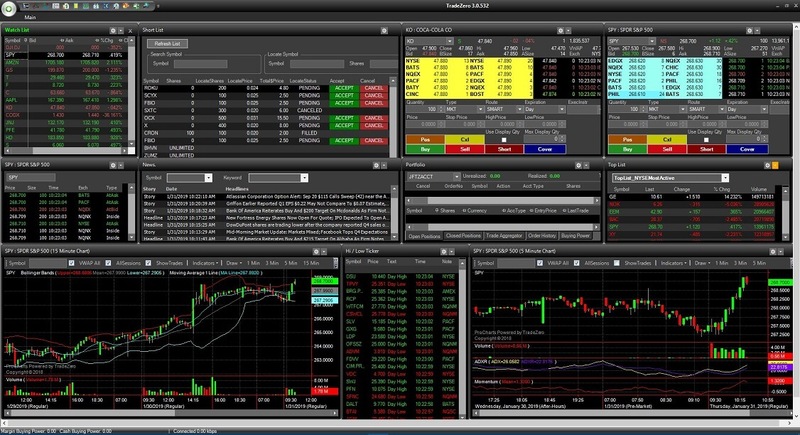 The platform offers dynamic streaming quotes, charting and level II trading information. The windows are all customizable and you can save multiple layouts. This is a highly advanced trading platform that is extraordinarily customizable. ​If you are an active trader, this is probably where you would find the most functionality. ZeroPro also offers as many as six windows of level II information, and 10 windows of charting with indicators. Real-time news, stock screener, options trading, and alerts are all possible. ZeroPro isn’t free though, it costs $79 a month if you trade less than 100,000 shares a month. All things considered, with the flexibility of the trading platform, I would put this up there with some of the most popular platforms available today traders. If you are looking to make massive amounts of trades and rely heavily on technical analysis, you will like this platform a lot. ZeroWeb is exactly what it sounds like, an online and web-based platform. This trading platform features many of the same benefits of the ZeroPro platform, except there are only six windows for charting, and for windows of level II information. 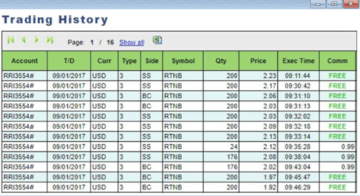 You do not have the ability to set alerts or trade options in this version, and there is no stock screener. However, you can access it anywhere there is an Internet connection and a browser available. This package is $59 a month, unless you trade over 80,000 shares during that month. ZeroFree is what you would expect free. However, there is no free level II Windows, but you can add them on four $25 per month. You can have two charts with indicators, you receive real-time news, but do not have the ability to trade options without paying an extra $25 per month. It also does not offer custom layouts. However, if you are looking for more of an investment scenario instead of frequent trading during the day, this platform is more than robust enough. ZeroMobile should be thought of more as an add-on to your other platforms, as it gives you the ability to keep an eye on your trading positions while on the go, but it also gives you the option to monitor real-time level I quotes, as well as real-time news. Charting with indicators is included, but it’s only one window as you would expect on a small screen. In general, think of this as a way to monitor your financial concerns while away from the desk. It should be pointed out that this platform is included with all other platforms, and of course is free as a benefit for TradeZero customers. TradeZero specializes in US stock markets, allowing access to the New York Stock Exchange, American Stock Exchange, and the NASDAQ. They also offer “Pink Sheets” as well. This allows traders to buy Stock, ETF, and Warrants. Beyond that, they also offer options on these products, so this is most certainly geared for those looking for exposure to the US markets in general. 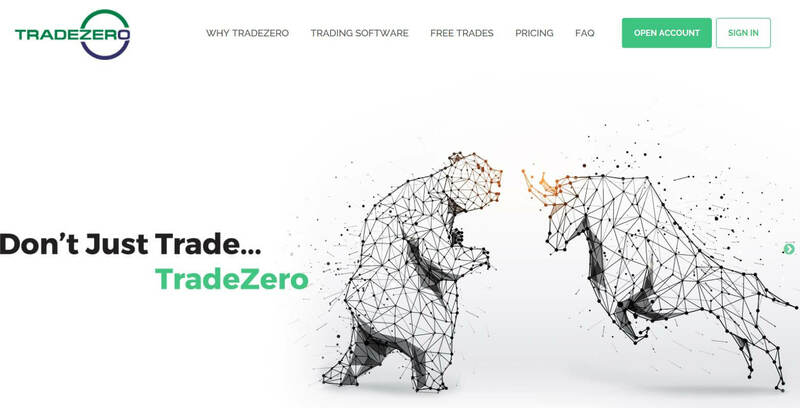 With that being said, what TradeZero offers is cheap access to the markets and gives the trader the ability to save quite a bit on commissions. All accounts are the same with the exception of leverage. As a general rule, the more you have in your account, the higher the leverage that you are able to trade with, up to 6 to 1 if you have more than $2500. Be advised that Bahamian and American citizens cannot open an account at the main firm, but there is another branch of the firm known as TradeZero America. The commission structure is one of the most appealing parts of the brokerage. OTCBB and PINK Sheets are at $0.002 per share, with a minimum of four dollars. ​Stocks trading under $1.00 on the NYSE, AMEX, or NASDAQ during the grace period are also charged at $0.002 per share. Both of these types of shares are free after the first 250,000 shares or traded for the month. There is $0 commission on all market and limit orders at the NYSE, AMEX, and NASDAQ. This is for securities that are priced $1.00 or more. (Keep in mind that this is for 200 shares or more. If less than 200 shares, you do not qualify for free trades.) Beyond that, there are the usual fees charged according to regulations and the like, all of which are out of the broker’s hands. Options trades are free as well, with small regulatory fees per contract. An option exercise or assignment does cost $35 though. This is probably the weakest link when it comes to this broker. There simply is no education or research available, but they do mention that they have partnerships with other companies that can help. At this point though, there is so much free education and research online that it won’t necessarily be a major deterrence for opening account. This isn’t what TradeZero is, a full-service shop. They are about execution of trades, for those who already know what they want. If you are looking for a brokerage firm that offers a lot of education and research, you will probably need to keep looking. To be honest though, there is so much in the way of good free analysis online these days that if you really like this brokerage firm you can make this situation work out quite nicely. Also, you should keep in mind that there are top-notch analysts out there that sell subscriptions that most professional traders prefer anyway. While analysis at brokerage firms can be quite good, there are those out there who do nothing but that, although those of course come with a cost. TradeZero offers the usual customer service, with phone service available during market hours of operation, meaning 9 AM to 5 PM Eastern Standard Time. The phone number is 1-877-4-TRADE-0 for the New York office. The Bahamian office in Nassau can be reached at 1-954-944-3885. They also keep the same hours. Beyond that, there is the availability of email support, and of course online chat. Again though, this is not a full-service brokerage, so one should expect help with execution more than anything else. If there is a technical issue, they can be easily reached during market hours. Outside of market hours, you will not find much in the way of customer service. That’s one of the trade-offs of a “bare-bones” brokerage house. Excellent customer service is something you typically pay for through commissions. However, the firm is adamant about getting back to their traders the next business day when issues arise overnight. Clearly, TradeZero isn’t going to be the first place that ​day trading beginners run to. However, if you are looking for zero commissions for the types of trading mentioned, then that’s obviously the big appeal. However, you have to understand when you get them for free. It's only if you provide liquidity and do not execute your trade immediately. That can become a huge problem if you are day trader. The platforms that they offer are quite robust, even the one that is free. With that being the case, if you want a functional brokerage firm that can offer you access to the US markets then TradeZero might be for you. The value conscious trader will of course find this brokerage to their liking. If you are looking for stock selection and perhaps some type of analysis, you will be looking elsewhere. ​As a day trader based in the United States, you should consider reading the SpeedTrader Review and Zacks Trade Review to learn more about two great alternatives to TradeZero. Day Traders outside the United States may find a good alternative in SureTrader. If you are looking for the usual bells and whistles, keep in mind that you will be paying for them in the form of higher trade commissions, as well as some extra charges depending on the shop you choose. For that reason, retail traders aiming for a lot of education should be willing to pay higher commissions may go with a brokerage like TD Ameritrade.